Go to original pattern for design DROPS 94-24. DROPS Long top with lace pattern knitted in Safran. 250-300-300-350-400 g colour no.17, White. Drops circular needle size 3.5 mm or the size needed to obtain the correct gauge. Drops small circular needle size 3.5 mm for neck. 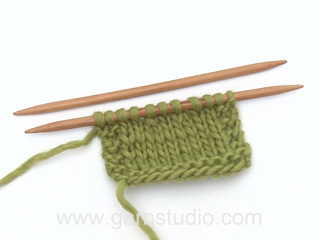 You can get the yarn to make this pattern from	5.75£. Read more. Knitting Gauge: 21 sts x 30 rows on needles size 3.5 mm in lace pattern with Safran = 10 x 10 cm, and 25 sts x 30 rows of rib-2 = 10 x 10 cm. Lace pattern: See diagrams M.1 to M.5. The diagrams are seen from the right side. 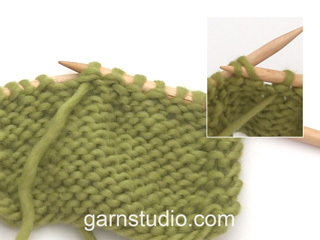 Decreasing tips (for raglan): Bind off as follows at every transition between the sleeve and the front and back piece (begin 3 sts before the marking thread): K2 tog, K2 (marking thread is now in between these 2 sts), slip 1 st as if to knit, K1, psso. Front piece: Please read the entire pattern before starting – Work forward and backward on circular needle. 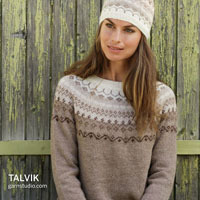 Cast on 146-158-170-182-206 sts (inclusive of 1 seam st each side) on needles size 3.5 mm in Safran. P 1st row from the wrong side, and continue in Rib-1 and a seam st each side. After 2 rows dec. all P4’s to P3 = 122-132-142-152-172 sts, and continue the rib K2/P3 (seen from the right side). When the piece measures 10 cm K1 row from the right side, at the same time adjusting number of sts evenly on row to 102-110-120-130-142. Knit the next row from the wrong side as follows: 1 seam st, 2-2-3-0-2 stocking sts, M.1 over the next 96-104-112-128-136 sts, 2-2-3-0-2 sts of stocking sts and 1 seam st. Knit 1 repeat – NB: On the rows where the pattern says P from the right side, P over all sts including the 2-2-3-0-2 stocking sts at each side of M.1. At the same time, on the second but last row in M.1 adjust the number of sts to 99-107-123-131-139. Continue the next row from the right side as follows: 1 seam st, M.2A over the next 88-96-112-120-128 sts, M.2B (= 9 sts) and 1 seam st. Knit 1 repeat – at the same time on the last row in M.2 adjust the number of sts to 98-104-116-128-140. Continue in M.3 with a seam st at each side. At the same time when the piece measures 26 and 38 cm dec 1 st each side = 94-100-112-124-136 sts – knit the sts not fitting into pattern in stocking sts. When the piece measures approx. 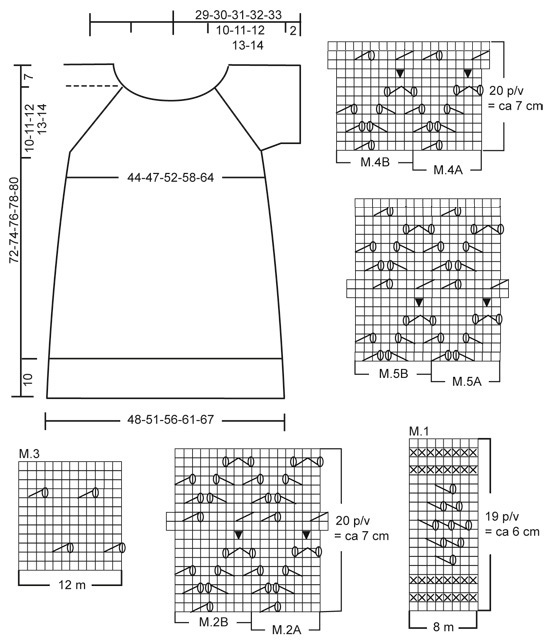 46-47-48-49-50 cm – adjust M.3 so that you have knitted 2 rows of stocking sts after a row of lace holes and the next row is from the wrong side – continue as follows: 1 seam st, 2-1-3-1-3 sts of stocking sts, M.1 over the next 88-96-104-120-128 sts, 2-1-3-1-3 sts of stocking sts and 1 seam st. Knit 1 repeat (remember to P from the right side over all sts) – at the same time on the last row of M.1 adjust the number of sts to 95-101-111-123-137. 1 seam st, 2-1-2-0-3 sts of stocking sts, M.4A over the next 80-88-96-112-120 sts, M.4B (= 9 sts), 2-1-2-0-3 sts of stocking sts and 1 seam st. Knit 1 repeat of M.4 and continue in M.5 the same way until finished measurements. At the same time when the piece measures 55-56-57-58-59 cm bind off 7-7-7-9-9 sts each side = 81-87-97-105-119 sts left. Put the sts on a thread and knit the back piece. Back piece: Cast on and knit as front piece. Sleeve: Knit the sleeve forward and backward on circular needle. Cast on 72-77-82-87-92 sts (inclusive of a seam st each side) on circular needle size 3.5 mm in Safran. P 1st row from the wrong side, and continue in Rib-2 and a seam st each side. When the piece measures 2 cm – make sure the next row is from the right side – knit 4 rows of garter sts – at the same time dec 1-2-3-2-1 sts evenly distributed on on 1st row = 71-75-79-85-91 sts. Now bind off 7-7-7-9-9 sts each side and put the remaining sts on a thread. Knit 1 more sleeve. Assembly: Sew the front and back pieces tog inside the seam sts. Sew the sleeves tog inside the seam sts. Yoke: Insert the sleeves on the same circular needle as the front and back where you bound off for the armholes = 276-296-324-344-384 sts. Insert a marking thread at all transitions between front and back and sleeves = 4 marking threads. Knit 1-2-1-2-1 rounds before decreasing – NB: continue the pattern (M.5) on the front and back pieces as well as the sleeves (make sure to begin the pattern on the sleeves on the same pattern row as front and back pieces and knit 0-2-0-1-0 sts of stocking sts each side (M.5A are knitted over the first 48-48-56-56-64 sts and M.5B over the last 9 sts). Knit sts not fitting into pattern in stocking sts, and make sure to dec. as many sts as you make yo’s so that the number of sts outside the raglan decreases is constant. Raglan decreases: Dec 1 st each side of the marking threads (= 8 decreases per round) – see Decreasing tips above: Dec on every other row 15-16-18-19-21 times – NB: Knit sts not fitting into pattern in stocking sts. Neck: At the same time when the piece measures 63-65-67-68-70 cm put the centre front 39-43-47-51-57 sts on a thread for neck. 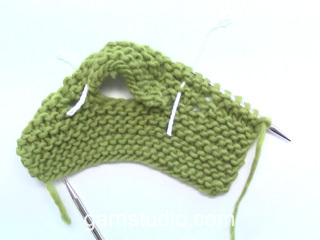 Bind off on each neckline on every other row as follows: 2 sts 1-1-1-2-2 times and 1 st 2 times. After all dec for raglan and neck there are 109-117-125-129-147 sts left on row. Cast off. Neck edge: Pick up approx. 156-212 sts around the neck (including the sts from the thread at the centre front) on a small circular needle size 3.5 mm with Safran. P 1 round, K 1 round at the same time dec evenly on round to 120-130-130-140-140 sts. Continue in Rib-2 until the neck edge measures 2.5 cm. Bind off loosely in rib. Insert the silk ribbon in the top row of M.3 and tie a knot/loop. Ik snap het niet goed, M2 wordt dit van rechts naar links gelezen ? Als ik van links naar rechts A1 lees dan valt een stuk van het figuur uit mijn breiwerk. Of stel ik nu een heel domme vraag ? Hallo Griet, Je begint de telpatronen altijd rechts onder en dan lees je naar links. Misschien is het handig om deze insctructie even te lezen, daarin staat uitgelegd hoe je telpatronen leest. Im confuses about M.2B row 5 and the overlap with M.2A. How does the row start? Is this correct? Seam st, *Yo, K3, Yo, slip 1 (k, k1, psso), k1, k2tog* (repeat *-*) until last 9 then k2tog, Yo, K3, Yo, slip 1 (k, k1, psso), k2, seam st.
Dear Rebekah, the last st in M.2A will be worked together with the first st in M.2B = the YO will now below to M.2A and the last st in M.2A will worked tog with the first st in M.2B. Same happens when repeating M.2B: the last st in M.2B will be worked together with the first st in next M.2B. Happy knitting! Efter M.1 strikkes næste p således fra retsiden: 1 kantm, 2-1-2-0-3 m glatstrik, M.4A over de næste 80-88-96-112-120 m, M.4B (= 9 m), 2-1-2-0-3 m glatstrik og 1 kantm. Når M.4 er strikket 1 gang i højden strikkes M.5 på samme måde - M.5 gentags til færdig mål. Men hvad er færdigt mål??? Inden bærestykke? Hej Dorthe, Bærestykket starter når du har lukket af til ærmegab "Samtidig når arb måler 55-56-57-58-59 cm lukkes der 7-7-7-9-9 m af i hver side til ærmegab = 81-87-97-105-119 m på p." Se også målene på tunikaen nederst i måleskitsen. God fornøjelse! Silly question...when starting front piece, instructions read cast on 158 (inclusive of seam stitch at each end), does that mean cast on 160 total or are the seam stitches included already in 158. Thanks! Dear Mrs Peckham, on row 5 and 15 K tog the last st in M.2A with the first st in next M.2A /M.2B - inserting a marker after each repeat can be a good idea to follow diagram. Happy knitting! Kann dieses wunderschöne Longtop auch in Runden gestrickt werden? 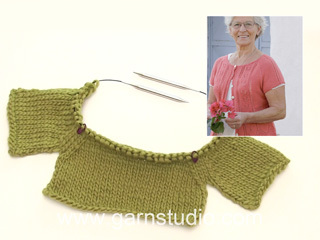 Liebe Iris, es spicht nichts dagegen, das Top in Runden zu stricken. Sie müssen an dieser Stelle das Muster als Ganzes betrachten, also einfach im angefangenen Rhythmus weiterstricken. M.2B zeigt, wie die R endet. Sie stricken also in der 5. R 2 M re, * 2 M re überzogen zusammen, 1 Umschlag, 3 M re, 1 Umschlag, 2 M re zusammen, 1 M re *, von *-* wdh, die R endet dann mit 2 M re überzogen zusammen, 1 Umschlag, 3 M re, 1 Umschlag und 2 M re zusammen. Charts M4 are shown as 11 rows. So row 11 is knit from the RS. You cannot knit both the last row of chart M.4 and the first row of chart M.5 from the RS without a purl row between them. The same problem is in chart M.5 where it starts and ends with a knit row from the RS. It needs a purl row added. I still believe row 7 in chart M.4B should be K2tog, K4 (NOT K3), YO, k2tog, k2. I'm sorry if I didn't explain this well in my other post. Dear Mrs Gerripho, thank you, diagram M.4 and M.5 have been updated. Happy knitting!